Reta Job Perez, 83, dear mother, grandmother and great-grandmother, passed away March 25, 2017, at her home in St. George, Utah. She was born Jan. 10, 1934, in Salt Lake City, Utah, to her parents, Rear Alonzo Eyre and Mable Maddox Eyre. She married Dennis Rae Job in February of 1956. She and Dennis had six children and in 1989 Dennis passed away. She got remarried in May of 2005 to Frank Perez and in 2015 Frank passed away. She was raised in Sandy, Utah, where she graduated from Jordan High School. She lived and raised her family in the Salt Lake City area. 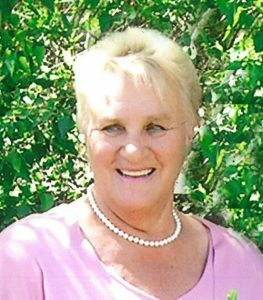 She enjoyed bowling, riding her bike, going to the spa, and watching her kids and grand kids play sports. She is survived by her six children: Scott (Kim) and their kids: Trina and Derek, Launa (Rick) and their kids: Danny and Kristina; Terri (Norm) and their kids: Brittan, Brandon, Brooke and Bryce, Ryan, and his son: Denny, Billy and his kids: Tad, Tyler and Jordan; Bonnie (Shane) and their kids: Danica, Nicholas, McKenzie and Hayden. She is survived by her brothers: Harold, Ralph, Roy and Glen; her sister, Gloria; and 24 great-grandchildren. She was preceded in death by her parents; her sisters Ramona, Mildred, and Darlene; her first husband, Dennis, and her second husband, Frank. The family would like to thank all of the hospice nurses and Nicole for taking special care of our mother even on her days off. We would also like to thank her great neighbors for periodically checking in on her. Funeral services will be held Friday, March 31, at 12 p.m. at the Cotton Acres LDS Ward Chapel 2583 E. 350 N. St. George, Utah. A visitation will be held from 10-11:30 a.m. prior to the service. Interment will take place following the funeral service at the St. George City Cemetery at 650 E. Tabernacle in Saint George, Utah. Arrangements have been entrusted to the care of Serenity Funeral Home. For condolences, full obituary, and funeral listings please visit Serenity Funeral Home online.